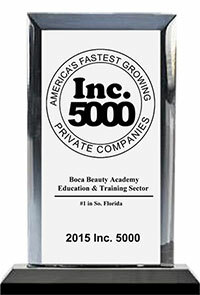 Boca Beauty Academy, the nation’s leading beauty and wellness school, made the 2015 Inc. 5000 list, which ranks the fastest growing private companies in America. Located in sunny South Florida, Boca Beauty’s top-rated health and beauty programs attract students from all over the country, as well as the world. With its state-of-the-art programs and two upscale campuses, it’s no wonder many students are choosing Boca Beauty to help them kick start their careers. Many of the school’s graduates are chosen to work at the world’s best spas, resorts, salons, gyms and fitness centers. When it earned its spot on Inc. 5000, the Boca Beauty Academy had a massive three-year growth rate of 132%. Its continuous growth is telling of the fantastic programs and opportunities the school offers. In correlation with this growth, Boca Beauty Academy recently established its second flagship campus in Broward County, where it also added more degree offerings. At the Broward County Campus, students can study sought-after programs like Barbering, Master Fitness Coach, and Personal Fitness Trainer. Boca Beauty’s first campus is located in Palm Beach County and offers many additional programs for students to choose from. These programs include cosmetology, electrolysis, skincare, full specialist, instructor training, laser hair removal, makeup artistry, massage therapy, microdermabrasion, nail technology, paramedical esthetician, permanent makeup, spa therapy and Xtreme lashes. At Boca Beauty Academy, a student’s journey doesn’t end at graduation. Even with a degree, many students find it difficult to get a good job after graduating. The school cares about the lifelong success of its students and offers job placement assistance. Boca Beauty Academy reviews the latest job opportunities to help its students navigate the competitive job market and secure a good job that suits their experience and aspirations. To learn more about Boca Beauty Academy, visit www.bocabeautyacademy.edu. Contact (541) 487-1991 for the Palm Beach County Campus or (954) 866-1011 for the Broward County Campus.